The fresh or frozen coconut milk in this recipe really resembles the taste and texture of traditional western ice creams. You can make your own fresh coconut milk. But for convenience and price I buy frozen coconut milk in the freezer section at my local Asian Supermarket and I keep it on had for many other recipes. I’m telling you, fresh or frozen coconut milk in this recipe really resembles the taste and texture of traditional western ice creams. Substituting any other milk in this recipe will not be nearly the same. Luckily enough, coconut milk is a healthy, acceptable choice for all five types of Wholetarians. 3 cups (16 oz) frozen coconut milk, thawed. I prefer the fresh taste of Tropics frozen 100% pure but you can use canned milk if you know you like it. I happen to not like canned. (Canned contains 1½ cups and Tropics frozen has 2 cups). I only use fresh coconut milk from Tropics so I add almond or cashew milk for the additional 1 cup so I don't have to thaw out another 2 cup bag of coconut milk). ½ cup raw cream (optional) OR ¼ cup coconut cream if you prefer it more creamy. 2 eggs (optional, they will stay raw) only use if you prefer it a creamier French vanilla. ½ cup maple syrup or raw white honey or a mixture of both (can use ¼ cup maple syrup and or honey and 7 drops of stevia instead) Do not put in too much stevia- as it can ruin it. Use stevia sparingly and taste as you go to your liking. Remember that once it is frozen, it will taste a little less sweet. Blend in the blender until well mixed. Assemble the Cusinart Ice Cream machine and turn it on. Pour the ice cream mixture into the freezer bowl, turn and let it mix until frozen, about 20 to 25 minutes. The ice cream will have a soft, texture. 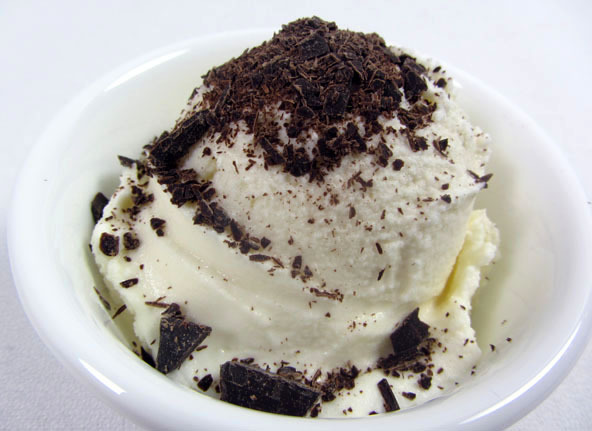 For a firmer consistency transfer the ice cream to the freezer for about 30 to 60 minutes. If you don't have an ice cream freezer you can pour the mixture into ice cube trays, freeze until mostly frozen and then blend together in a high powered blender. The coconut milk is what makes this ice cream so creamy and delicious. If you know you like canned coconut milk then you can use that but be aware that not everyone likes it canned. The taste of canned is very different from freshly made or frozen. You can make your own fresh coconut milk here. 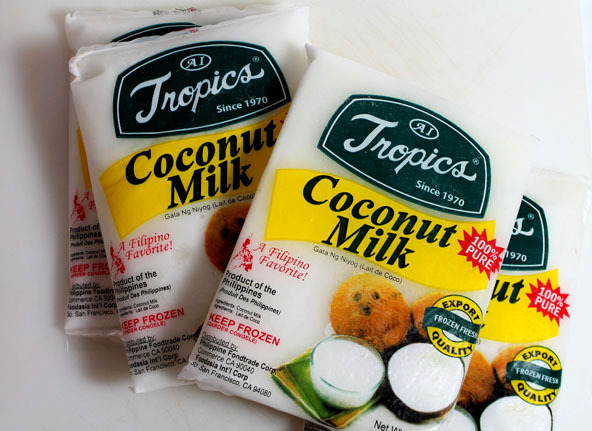 For convenience and price I buy frozen coconut milk in the freezer section at my local Asian Supermarket. 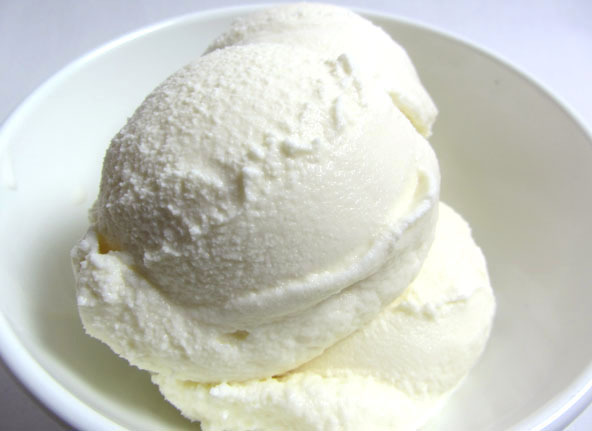 I'm telling you, fresh or frozen coconut milk really resembles the taste and texture of traditional western ice creams. Substituting any other milk will not be nearly the same. Using honey will keep it from freezing hard. I prefer using maple syrup unless I'm expecting left-overs. 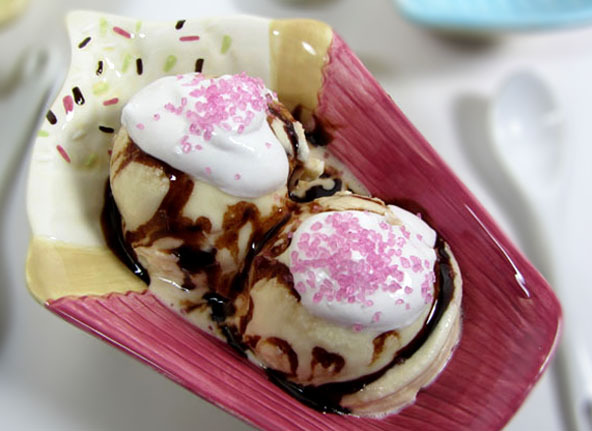 See Whipped Coconut Cream topping recipe shown on top of the ice cream. See India Tree Natural Dye Sprinkles here.